The Bermans wanted to create an outdoor space, where they could enjoy their yard with friends and family and have easy access to their young children while they play in the back yard. Although their back and side lawns had two level areas well suited for activity, it was a little difficult to access them from the central living areas of the house. 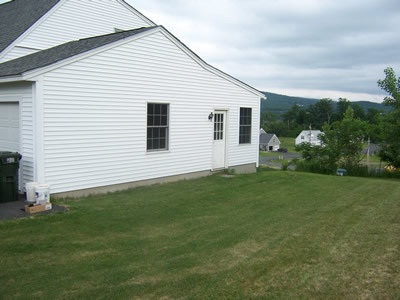 The side and back yards were at different elevations, with a steep slope between them. The family had to go downstairs, through the unfinished basement, to access the back, or out the front door and around the house. This was especially challenging for a mother with three young and very active children. 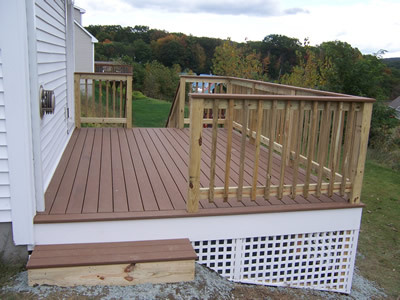 The answer for this family was a deck and an additional exterior door. 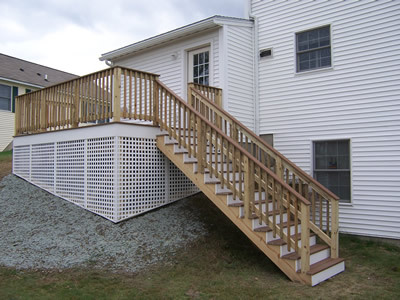 The deck was built at the level of the kitchen and side yard, with stairs to both the side and lower back yards. 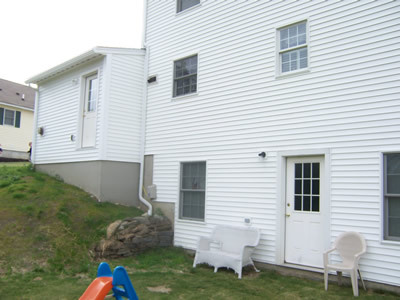 The additional exterior door allows the family to access the deck and yards from the kitchen. 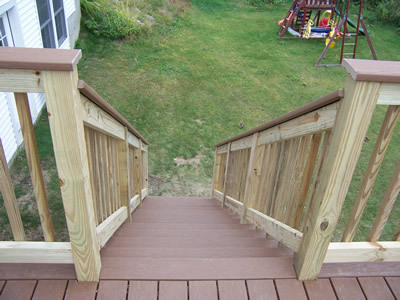 The decking also serves as a cap on the rail system and will not splinter with age like a pressure-treated cap would. 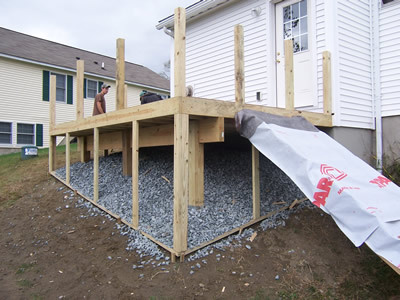 The Bermans wanted the durability of pressure-treated framing and railing material and the ease of low maintenance associated with composite decking. Scope: We had a mud room and deck put on the back of our house behind the garage. We had the mudroom added because the access into the house from the garage was directly into our small kitchen. The door opened up right in front of our stove. With the addition of the mudroom, it gave us extra space to open the door from the garage and a have a place for our coats/shoes before entering the rest of the house — something very important for our family of five. The deck allowed us direct access to our back yard from the first floor living space - something we did not have before. Time Frame: The schedule worked well for our family and all the workers were careful to work around us when possible. Both jobs were done in a timely manner. We felt the cost was fair for the great quality of work that was provided. Summary: Peachtree Builders did a great job. Their attention to detail, dedication to the job and overall attention to our schedules resulted in a great product with minimal family interruption. The mudroom and deck are now important features of our home. We use them all the time and find it hard to remember what we did before we had them. We´ve already had Peachtree do additional work for us, and we plan even more in the future.